The rapid adoption of cell phones and, especially, the spread of internet-connected smartphones are changing people’s communications with others and their relationships with information. Users’ ability to access data immediately through apps and web browsers and through contact with their social networks is creating a new culture of real-time information seekers and problem solvers. 41% of cell phone owners used their phone in the previous 30 days to coordinate a meeting or get-together. 35% used their phone to solve an unexpected problem they or someone else had encountered in the previous 30 days. 27% used their phone in the previous 30 days to get information to help settle an argument they were having. 23% used their phone in the previous 30 days to look up a score of a sporting event. 20% used their phone in the previous 30 days for up-to-the-minute traffic or public transit information to find the fastest way to get somewhere. 19% used their phone to get help in an emergency situation. In all, 70% of cell phone owners – representing 62% of the entire adult population – have used their phone in the previous month to do at least one of these real-time searches. The young, the relatively well-educated and well-off, and parents of minor children are more likely than other kinds of cell owners to have used their cell phones recently for the just-in-time activities we measured in this survey. 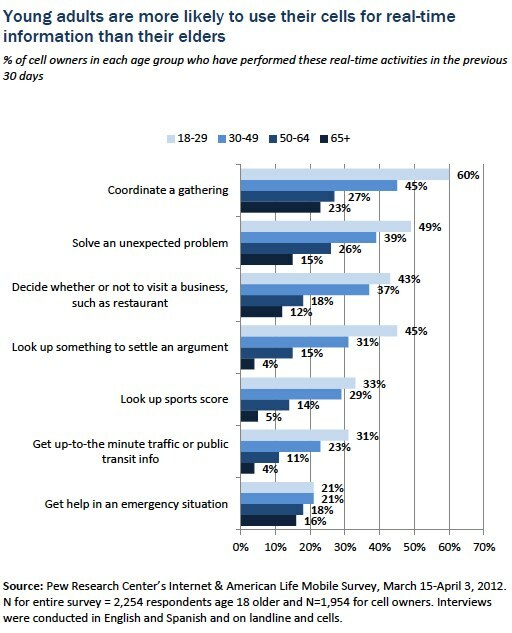 Younger cell phone users are considerably more likely than older users to have done these kinds of searches. Overall, 88% of cell phone owners ages 18-29 had performed one or more of these activities in the past 30 days, compared with 76% of cell owners ages 30-49, 57% of cell owners ages 50-64, and 46% of the owners age 65 and older. Some 86% of smartphone owners have used their phones for at least one of these purposes, a figure that is considerably higher than among other cell users —52% of non-smartphone owners have used their phone for some sort of just-in-time searching in the preceding 30 days. 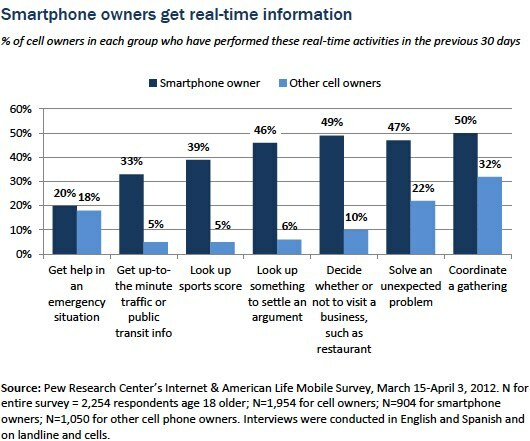 These smartphone owners are also considerably more likely than other cell users to have done each of the individual activities we measured in our survey—the only exception is getting help in an emergency situation, as both smartphone owners and other types of cell owners were equally likely to have used their phone recently for this purpose. Men who own cells are more likely than women cell owners to have used their phones in the past 30 days to look for information that settles an argument or disagreement: 31% of males who own cells have done this, compared with 22% of women cell owners. 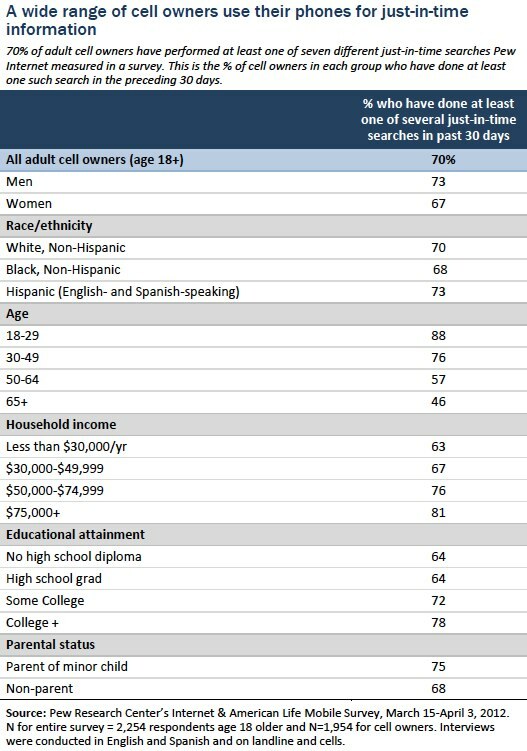 In addition, male cell owners (31%) are more likely than females (14%) to have used their phones to check on sports scores.Overall, men who own cells are more likely than women to have used their phone in the past month for at least one of these purposes: 73% of men who own cells have done at least one of these things, compared with 67% of women. Parents of minor children are more likely than non-parents to have done several of these just-in-time searches in the past 30 days: Compared with cell owners with no minor children living at home, parents who own cell phones are more likely to have used their phones to solve an unexpected problem (40% vs. 33%); to have used their phones to decide whether to visit a local business (38% vs. 27%); to have looked up something to help settle an argument (32% vs. 24%); and to have looked up a sports score (28% vs. 20%). White cell phone owners are more likely than minorities to have used their phones to coordinate a gathering in the past 30 days. Some 43% of white cell owners have done this, compared with 33% of African-Americans who own cells and 34% of Hispanic cell owners. On the other hand, African-American cell owners are more likely than whites to have used their phones in the past month to get up-to-the-minute traffic or public transit information: 31% vs. 16%. People living in higher income households are more likely than the less well-off to have used their cell phones in the past month for these purposes. And people with higher levels of education are often more likely than those with lesser levels of education to have used their cells for these reasons. 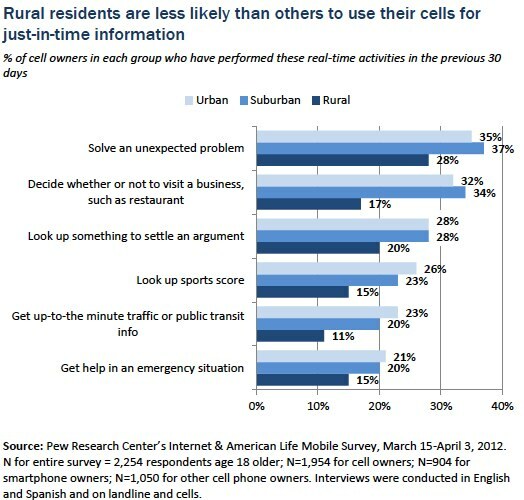 In addition, rural cell users are less likely than suburban and urban users to have done some of the just-in-time searches in the past month. The just-in-time information searches discussed above are just one way in which cell owners are using their phones to access detailed information and advanced applications through their mobile devices. We asked owners of cell phones who get email, have apps, or access the internet on their phones several questions about their general use of their phones. Some 65% of smartphone owners say they have used their phone to get turn-by-turn navigation or directions while driving, with 15% doing so on a typical day.